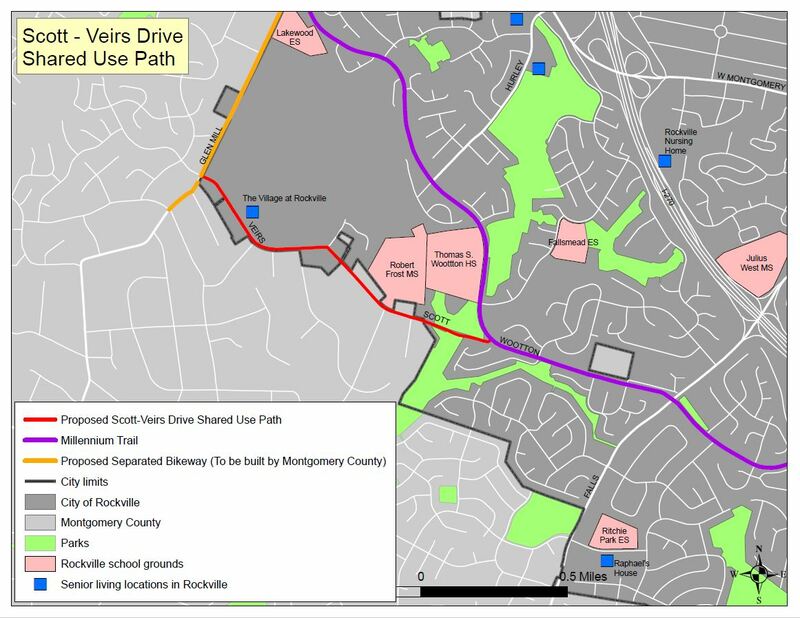 The City of Rockville has received $60,000 from the National Capital Region Transportation Planning Board at the Metropolitan Washington Council of Governments for a feasibility study for a new shared-use path along Scott Drive and Veirs Drive to Glen Mill Road. If built, the path would provide a bike connection between the existing Carl Henn Millennium Trail and the new Pepco Trail being constructed by Exelon and Montgomery County. The 6-mile Pepco Trail will connect the South Germantown Recreational Park with Muddy Branch Stream Valley Park. 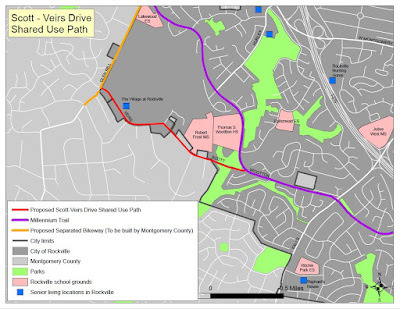 Schools and a senior living community are among the properties that would benefit from the new path, which was called for in the Rockville Bikeways Master Plan approved in 2017. The feasibility study will determine the best alignment for the path along the route. Once completed, engineering work can begin on the project. I live in the neighborhood to the west of Glen Mill Rd. (to the left of the yellow line on the map). There is a desperate need for a safer sidewalk along Scott Drive from the Glen Mill to Robert Frost. At times, the grass strip along the sidewalk is only 18" wide, with no curb along the entire path. Several years ago, our community walked this path to school along with school officials to examine the need for buses, as opposed to making kids walk along this unsafe roadway. During the walk, a car veered right off the road onto the narrow grass strip, right in front of the school officials. Still, they saw nothing wrong with the pathway. I walked on the sidewalk last weekend and was forced to duck under low-flying branches, and at several points, had to sidestep into the roadway occasionally to make it through the thicket. This pathway is dangerous, and needs to change.